O pitoresco e tranquilo Northshore Villa está situado no coração da vila de Anna Maria, na Ilha Anna Maria. Nosso 2 quartos casa de banho 1 foi recentemente atualizado para o prazer de nossos hóspedes. Sente-se no nosso deck pela manhã e desfrute de uma tranquila e tranquila xícara de café ou desfrute de um curto passeio para comer maravilhosamente frescos bolos, pães e café torrado na loja de antiguidades local e padaria ao lado de Magnolia e Gulf Drive. À tarde, a poucos passos de distância, estão algumas das melhores praias de areia branca da Flórida para relaxar ou mergulhar o dedo do pé ou mais no azul do Golfo do México. Passeie pela Pine Avenue. e voltar no tempo com fachadas de lojas e cafés e varandas todos com cadeiras de balanço. Experimente algumas das melhores lojas costeiras ao redor. Ao longo da Pine Ave., Spring Ave, ou Magnolia, você tem acesso rápido ao lado oeste da ilha, mostrando 7 milhas de uma praia de areia branca ou a leste, a uma curta caminhada até o lado da baía da ilha e passar o tempo no cais histórico da cidade, enquanto pesca, ou ver a ponte Sunshine Skyway. Enquanto na Pine Ave. Você também pode experimentar o pitoresco centro da cidade para sorvetes, restaurantes, teatros e lojas. Venha conhecer a ilha vivendo conosco. Jeff e eu temos vivido e trabalhado aqui na Anna Maria Island por mais de 20 anos e gostaria de compartilhar nosso pequeno pedaço do paraíso com você. A poucos passos da praia e Pine Ave! Praia vagão, guarda-chuva, e cadeiras fornecidas. Nossa casa tem uma excelente localização, a uma curta distância da praia, lojas, padarias, cafés, teatro, galeria de arte, restaurantes, cais da cidade, e muito mais! We just had a lovely week on Anna Maria and this cottage was perfect for all our needs. It has comfy beds, big sofas and a nice hot shower. Everything worked perfectly and the kitchen was well equipped. The best thing was the location just off Pine. We enjoy walking round the beach, cycling and visiting our favourite haunts such as the donut experiment, 2 scoops, Ginny and Jane’s and the Sandbar. All were a short walk from the cottage. Would definitely like to stay again. Thanks Michelle. So glad you enjoyed your stay please come again and thank you fir the great review!!!! 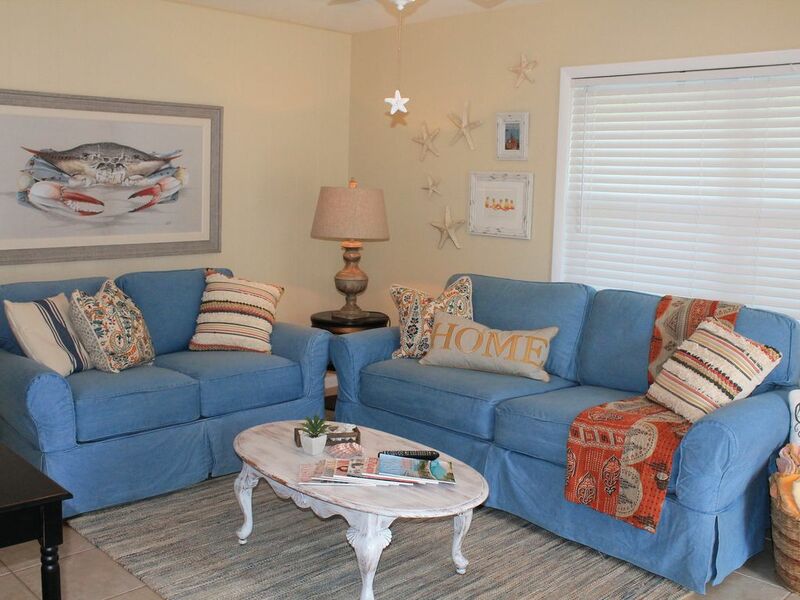 The property is very well decorated and close to the beach! This is a beautiful home, nice decoration and really close to the beach. Everything works and Michelle is a nice host! So glad you had a wonderful time we look forward to having you back soon ! This was a first time renting a house as well as out first time to AMI . We loved the island and the house . It was very cozy and close to the beach and a ton of cute stores .. Michelle was great to work with, I had to text her a few times during our stay and she always made me very comfortable in doing so, not like I was ever bothering her at all ..
We are so glad you enjoyed your stay with us. Please come again. We enjoyed our first visit to AMI, and this property worked perfectly for us. We usually stay on the water for beach visits, but we were looking for something a little more budget friendly for our family of five while still be close to the beach. We were a little concerned about sharing just one bathroom and the three kids sharing the kids' bedroom, but our two teenage boys shared the room with their 9 year-old sister without any issues, and one bathroom worked out just fine. We walked to beach everyday, often more than once, and we really appreciated the use of the beach chairs and wagon -- the wagon made everything easier! We decided to rent an extra umbrella from Beach Bums just for some extra cover at the beach, though we appreciated their having one at the house for us to use too. We also appreciated the short walk to the Donut Experiment for breakfast one morning, and the easy walk to the nearby shops and were in a good location for the 4th of July parade and fireworks. We had neighbors in the other half of the duplex staying with their small dogs, but we never heard any noise from them at any time and our contact with them outside of the house was very friendly. The house was clean, nicely furnished, and had the appliances we needed for the meals we fixed while we were there. MIchelle was great to work with, and the procedures for check-in and check-out were painless. If we return to AMI (which I hope we get the chance), we'd definitely try to stay here again. Thank you , we are so glad you enjoyed your stay with us. We love our little piece of paradise. Nothing fancy but a cute quiet place to unwind and relax with your family. Please come again. Perfect beach cottage and best location! Our family of four had such a great week here. Thank you!! Praia, praia, praia, passeios de praia, pôr do sol praia, natureza, passeios ecológicos com kayayks, ótima localização a pé distande a praia, shopping, teatro, restaurantes, padarias, galeria ilha, e muito mais! Basta trazer seus mantimentos, temos todo o resto para você. Rates are subject to change until reservation is confirmed. 7 night minimum is preferred and considered first on all reservations to assure maximum occupancy and less then 7 nights (4 night minimum) is allowed when there are gaps to fill according to owner's discretion. All reservations are final and no cancellations or refunds allowed, we highly recommend you book your travel insurance for these type of potential emergencies. If at anytime owner feels need to enter the property due to the safety of the guests or neighbors the owner will contact guest prior unless it is in the event of an emergency. 2 cars ONLY allowed , any guests visiting the renting guest may park elsewhere along the streets. NO PETS unless owner approves, no exceptions. No late check outs or early check in's without owners approval. If there is an opening at the end of a reservation then a late check out may be granted per owners approval only, anything after noon will be charged a 50.00 fee to be paid with CC or cash only. The island has a very strict 10:00 pm noise ordinance to ensure the peace and enjoyment of all residents and guests enjoying the island please adhere to the noise ordinance and respect the neighbors.